Weavile in game: 450 Who? Important notice! Pokemon Weavile is a fictional character of humans. 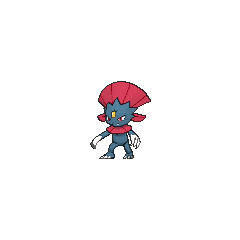 Weavile (Japanese: ???—? Manyula) is a dual-type Dark/Ice Pokémon introduced in Generation IV. 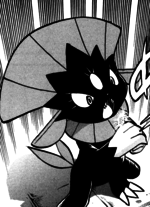 Weavile is devious and intelligent. It usually lives in cold, icy areas where it forms small packs. A pack of Weavile uses teamwork to take down its prey. It can communicate in the form of carving patterns on trees, ice and boulders. In Lucario and the Mystery of Mew, a Trainer named Kidd Summersowned two Weavile. 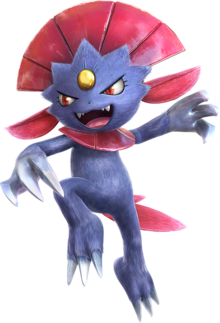 Weavile also made an appearance in Duels of the Jungle. Two Weavile were fighting over which one would rule a group of Weavile and Sneasel. Paul owns a Weavile which first appeared in Top-Down Training!. A Weavile appeared in Eevee & Friends. Kagetomo owns a Weavile which first appeared in The Legend of the Ninja Hero!. A Weavile under the ownership of Mable made its first apperence in An Explosive Operation!. 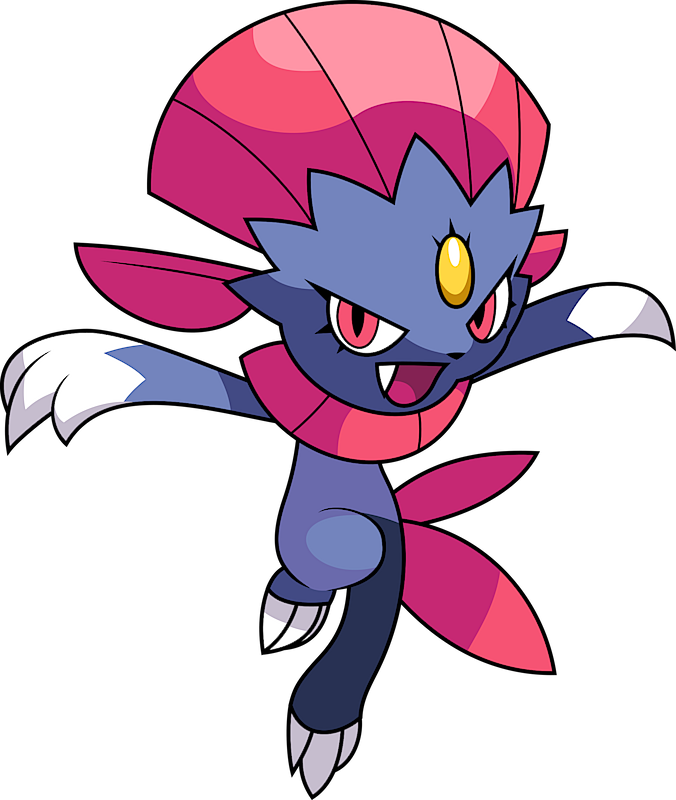 A Weavile appeared in Finals Not for the Faint-Hearted!, under the ownership of Alain, where it was used in the final round of the Lumiose Conference against Ash. A Coordinator's Weavile appeared in Another One Gabites the Dust! competing in the Chocovine Contest. 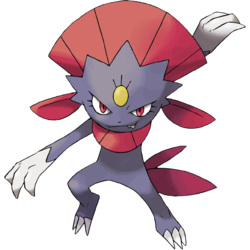 A Weavile participated in the Pokéathlon in A Marathon Rivalry!. 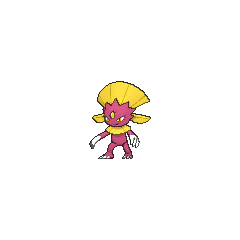 A Weavile was used along with a Lickilicky in the Battle Stage of the Daybreak Contest in Playing the Performance Encore!. 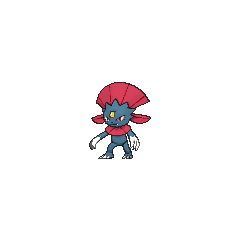 Zinzolin's Weavile appeared in The Frozen World. It was used alongside his Cryogonal to battle Drayden. Another Weavile appeared during a flashback in The Redemption as one of the many Pokémon fighting in the great war of Kalos, 3000 years previously. Silver owns a Weavile which evolved in the first round of the HeartGold & SoulSilver chapter. He is very close to him, being his very first Pokémon, obtained while he was only two years old. Cyrus has a Weavile which was used against Cynthia at the Veilstone Galactic HQ where it defeated her Spiritomb by freezing it. A Weavile appeared in a flashback in PAXY25. Cyrus sent out Weavile to battle Hareta, who fought back with his Piplup. Weavile proved to be a very dangerous opponent, even blasting Piplup off the bridge (where the battle took place) with its Hyper Beam. However, Piplup was able to use its Torrent to turn things around and defeat Weavile with a powered-up Surf. Dai Fugo used a Weavile. Because of its debut during the Advanced Battle season, Weavile appears in its season opening, Unbeatable, which is set in Hoenn, despite being a Generation IV Pokémon. Mime Jr. and Lucario also make opening cameos. Weavile weighs as much as Dawn. It shares this similarity with Porygon-Z. Weavile may be based on cats and weasels, but it also seems to draw inspiration from ?? kamaitachi, weasel demons with sickles on their front legs. It can also be based on black cat demons from both Western and Asian culture that have various backgrounds but are all known for their trickery and cunning. Its appearance seems to be based on old Egyptian fashion, as it "wears" a headdress, collar, and earrings. Its "eyeshadow" also resembles Egyptian makeup. It also bears a slight resemblance to Inca stone idols. Manyula is a combination of ? ma (demon), ?? sennyu (sneaking in), and ? yu (weasel, an alternate reading of itachi). Nyu itself may be a combination of ? ?— nya (the sound a cat makes) and ? yu. Mandarin Chinese ??? / ??? Maniula Transliteration of its Japanese name.